The main purpose of wheel bearing is to allow the wheels to rotate with minimal friction. When a vehicle comes to a stop, the bearings start to cool off and then a vacuum is generated from the lubricant, air, and contacting metal. The seals should hold the vacuum in place. If not, the sealed hub or the bearing will start pulling in air from the outside, which may include water and other contaminants. This can result in bearing damage and noise. What Causes Noise From Wheel Bearings? Wheel bearings are attached to the wheel and are constantly moving. Since the wheels are touching the road while driving, there could be a variety of reasons why the wheel bearing is making these strange noises or enduring damage. Here are the top 5 reasons for noisy wheel bearings. If your wheel bearings were replaced fairly recently, then it would be very strange if they were failing any time after that. The only conclusion is that the wheel bearings were somehow damaged because they were installed improperly or against the manufacturer’s recommendation. Wheel bearing seals are designed by engineers in a way so the pressure can leave the wheel bearings. They are installed at the factory with a petroleum based lubricant. The only bad thing is that this lubricant cannot stop water from getting through. 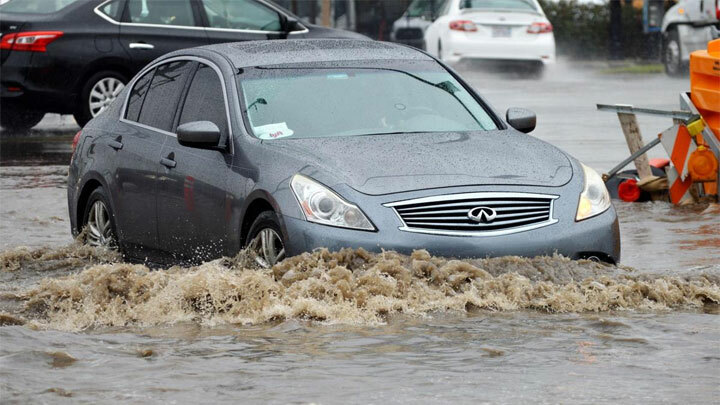 This means if you were to drive your car on a street that is flooded with water, then your bearings would be subjected to moisture. Once that happens, it mixes with the lubricant and makes it ineffective, causing the bearings to endure excess friction and ultimately be damaged. You would not be able to service or repair a modern style wheel bearing either. The only solution from water damage is to replace the wheel bearing completely. Wheel bearings receive the entire pressure of the weight of the vehicle. If you were to drive over a bumpy curb or pothole, the wheel bearing could be subjected to damage quite easily. When you hit something, the bearing’s balls will likely get forced into the race, the grooved ring where the bearing sits. The result will be small imperfections in the bearings. As you continue to drive the car with these imperfect bearings, it will cause more heat and friction. Soon the heat will cause tiny pieces to fall off which will pollute the lubricant of the wheel bearing and make it fail much quicker. However, it is possible the failure could take a few months before it is noticeable. The wheel system depends on its wheel bearing, tire, lower arm, lower joint, knuckle arm, and shock. 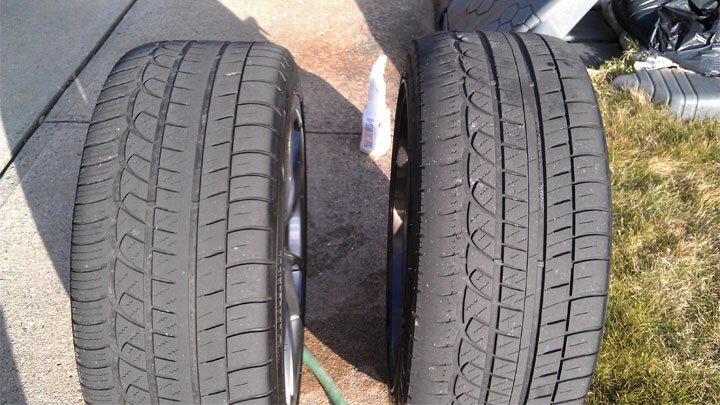 When your tires are unbalanced, some of those other parts could be damaged and then it will make noise come from the wheel bearing. 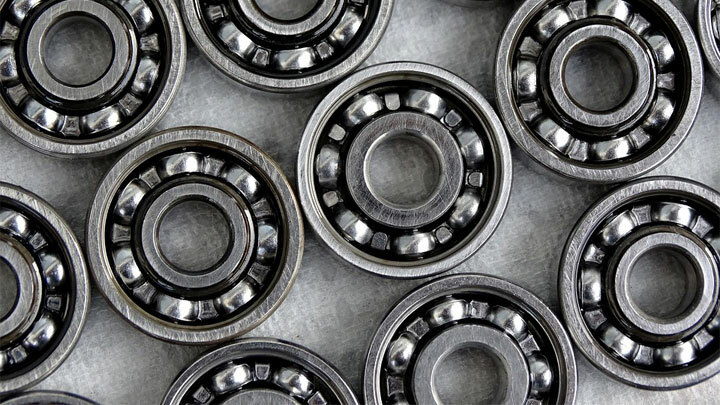 Wheel bearings are constantly in motion and they are connected to all the other parts mentioned in the last point. So, if the wheel area were to be subject to an accident, then the wheel bearing would likely also be damaged and then cause noise to form. With a damaged or broken wheel bearing, it may sound like you’re driving over a rumble strip on the shoulder of a highway. It won’t be very loud at first but gets more noticeable as the condition of the bearing gets worse. Wheel bearing noise can also sometimes be described as riding a bicycle as a kid that had a playing card attached to the wheel which hit the spokes as the wheel rotated. While driving at 30 to 40 MPH on an empty road, turn your steering slight left then right, almost like you’re safely weaving in your lane. Wheel bearing noise (especially in the front) will be amplified when you you make that turn since physics allow more weight of the car to be transferred to one side of the car. This can also help when it comes to diagnosing which wheel is causing the noise and has the bad wheel bearing. Here’s a video that indicates wheel bearing noise. You may need to turn up your volume to hear. Take a jack and use it to lift the vehicle up until the tire is off the ground. Now try moving the tire in a vertical direction, and then a horizontal one. If the wheel wobbles or has some free play, then there might be damage to the bearing. We made this video to demonstrate how to perform this inspection of the wheel bearing. Just remember the noise you hear from the wheel bearing tends to vary. The noise you hear depends on how badly the wheel bearing is damaged. Speed may also contribute to the noise from the wheel bearing. Sometimes you may be driving at 60 MPH and hear the noise, but then accelerate to 65 MPH and the noise goes away. This may happen only if there is a small amount of damage to the bearing. Therefore, you may not be able to notice this right away. You will only be able to tell by feeling for any excess play like mentioned above. If you do notice the wheel moving around as you push and pull on it, take your car to a repair shop or tire shop and have it looked at by a professional. They can confirm if there is damage to the wheel bearing or if another part is damaged like the wheel rim or the tire.